Collybia cirrhata is an odd little mushroom that grows on other mushrooms, in the way Boletus parasiticus grows on the earthball Scleroderma citrinum. But Collybia cirrhata and its close cousins colonize decayed mushroom remains--so well decayed, in fact, that one might easily wonder about other possibilities for the identity of the substrate; there are, after all, many mushroom species that colonize dung. You don't even want to know about the poking and sniffing that occurred to identify the blackened substrate in the illustration. The small whitish cap and the white spore print, together with the habitat on blackened mushroom remains, will serve to identify a small cluster of species which can only be further separated by groping around in the substrate. Read on if you think this sounds like fun; otherwise, mark your ID down as "Collybia tuberosa complex" and find something more sanitary (sane?) to do with your time. Collybia cirrhata belongs to the Collybia tuberosa species cluster, which includes those two species and Collybia cookei. Carefully examine the bases of your mushrooms; dig around with your fingers or a knife point. You are looking for "sclerotia"--little knots of tissue from which the mushrooms arise. If you find no sclerotia, but only copious white threads, you have Collybia cirrhata. If you do find sclerotia, you have Collybia tuberosa or Collybia cookei. Mushrooms with dark reddish brown, appleseed-shaped sclerotia are Collybia tuberosa. Mushrooms with pale yellowish to orangish, round or nearly round sclerotia are Collybia cookei. The latter species is usually found on soil, and only sometimes on rotting mushrooms. 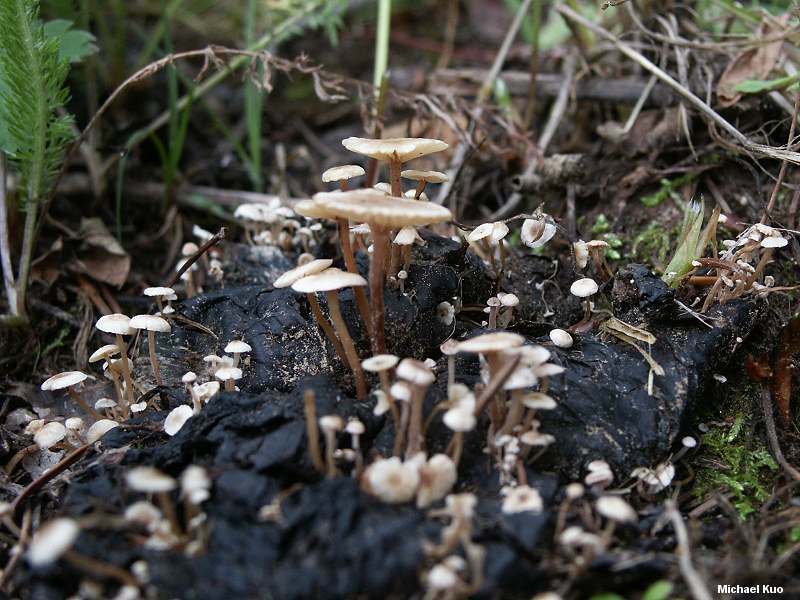 Ecology: Saprobic; growing gregariously on the blackened and sometimes nearly unrecognizable remains of mushrooms; found under hardwoods or conifers; summer and fall; widely distributed, at least in northern and montane North America. Cap: 3-11 mm; convex with an inrolled margin when young, becoming broadly convex to flat, with a central depression; dry or moist; bald; sometimes lined at the margin; whitish to faintly pinkish; fading. Gills: Attached to the stem; close or almost distant; whitish. Stem: 1-2.5 cm long; 1 mm thick; more or less equal; dry; pliant; often minutely dusted; whitish; basal mycelium copious and white; with many small, white mycelial threads extending into the substrate. 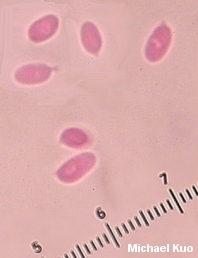 Microscopic Features: Spores 5-6.5 x 2-3 µ; smooth; ellipsoid to sublacrymoid; inamyloid. Pleuro- and cheilocystidia absent. Pileipellis a cutis or ixocutis of cylindric elements 3-6.5 µ wide. REFERENCES: (Schumacher, 1773) Quélet, 1872. (Saccardo, 1887; Kauffman, 1918; Coker & Beardslee, 1921; Lennox, 1979; Halling, 1983; Halling, 2003; McNeil, 2006; Trudell & Ammirati, 2009.) Herb. Kuo 08150303.